Police have unveiled their new weapon - Britain's biggest speed camera that can film a car a THOUSAND meters away and dubbed 'The Long Ranger'. The massive gun has been showcased at the launch of the pilot project called Operation Indemnis. Police in Gloucester are using the whopping camera to tackle motoring offences such as speeding and tailgating. 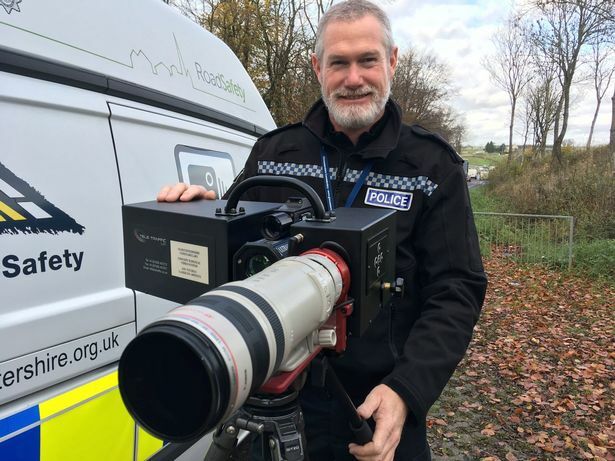 While speed guns have been able to detect how fast drivers are travelling, the new camera produces very clear video footage and still photographs of vehicles and the people inside them, GloucestershireLive reported. And Gloucestershire’s Police and Crime Commissioner, Martin Surl , said he hoped that would catch people using their mobile phones on the high-speed road. He was speaking at the launch of the pilot project which takes a new collaborative approach to the policing of the A417 and A419 - a major strategic route linking Gloucestershire and Wiltshire as well as the M4 and M5 motorways. At peak times, it carries an estimated 35,000 vehicles day and has become an accident hotspot. Officers will use the long-distance camera and automatic number plate recognition (ANPR) equipment to check on what vehicles are on the roads and how they are being driven. They said the main aim was to educate people about how to drive more safely, to prevent accidents that can kill or seriously injure people. Some drivers will be given advice about their driving while others, who have committed offences, will be prosecuted. The operation was launched in a lay-by on the A417 known as Granny’s Pumps. It is between Cirencester and the outskirts of both Cheltenham and Gloucester . If the pilot is successful, it could be applied to any road in the county. Mr Surl said: “This is one of the county’s busiest roads which also has one of the worst accident records due to the way it’s used. “Many people have come to me with their concerns about speeding and other safety issues along this road. "We now have a chance to test a new model of collaborative road policing which, if it proves a success, can be put into practice elsewhere. “The aim is not just to penalise motorists but to uphold the law by creating a change in people’s behaviour. Safe and social driving has always been one of Mr Surl’s priorities. He recently funded two additional camera enforcement officers and specialised equipment to reinforce the efforts of community speedwatch groups. The aim has been to reduce speeding, tailgating and the number of drivers using their mobile phones at the wheel and not wearing a seatbelt. Chief Inspector Mark Soderland said: “A core aim of the approach is collaborating wherever possible with other road safety stakeholders. The team has started with Highways England and the county council and is now approaching groups such as the Motor Insurers Bureau, The Institute of Advanced Motorists and the Driver and Vehicle Standards Authority to explore what opportunities there might be to work together and improve safety. “Criminality is also important to the operation. Having a police presence on a strategic road such as the A417 is also an excellent opportunity to prevent and disrupt criminals entering the county. Hence the use of ANPR and intelligence briefings. The project will be evaluated at the end of the year against a range of measures currently being developed. These will go towards determining its longer term sustainability and benefits.